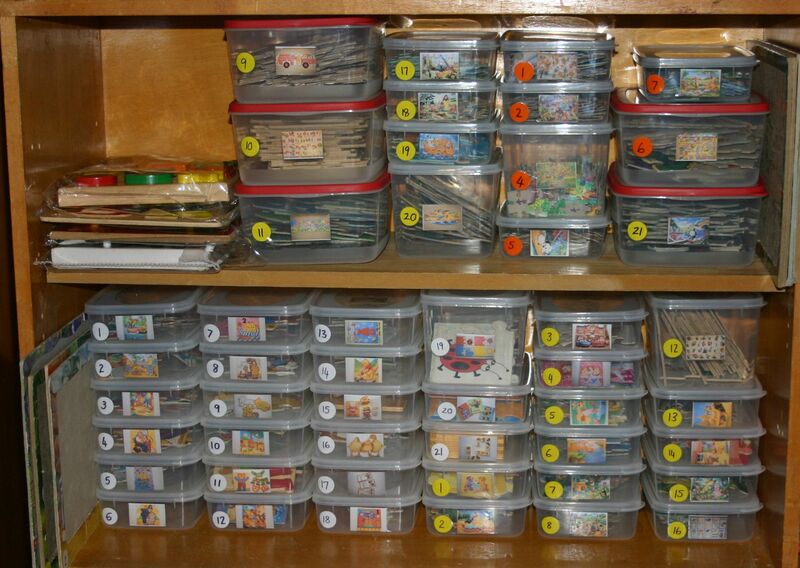 How do you store children’s jigsaw puzzles? The “after” photo. All those melancholy organisation junkies out there say aaahhhhh! After unsuccessfully searching for a suitably priced storage solution for our woefully disorganised jigsaw puzzle cupboard, I decided to come up with my own system. I have been frustrated at constantly having puzzle pieces mixed up, missing and the whole lot in an untidy jumble and sorting the mess out had finally risen to the top of the project priority heap! After looking at several different options that were going to be way too expensive for us, (we own a LOT of puzzles) I settled on clear plastic containers from Kmart. The “before” photo. The really scary thing is that I had already taken out about 15 puzzles when I thought to take a photo of what we started with. We had a marathon puzzle session where the children completed every puzzle we owned and I photographed the finished result. I threw out any that had been missing pieces for years and were unlikely to suddenly be found and those that were broken or very tattered. We gave several of the least loved away to friends and that still left a rather extensive collection, gathered from secondhand stores and markets over the years at a dollar or two each. I taped the photo of the finished puzzle to the front of the boxes so the kids can see which puzzle is in the container and choose what they would like to do. I also photographed the base boards from puzzles that had a back and attached these photos to the lids of the boxes so they knew to look for the matching board when they took the pieces out. The boards are now standing at the end of the bottom shelf. I separated the puzzles into three age or difficulty groups so that I can simply direct the twins for example to take any puzzle that has a white dot on the front. (Very frustrating for them to tip out and start a puzzle they have no hope of completing.) Finally, each box is numbered and every piece inside the box is numbered to match so that when a stray piece is found we can easily see which box it belongs in. The peg puzzles are stored in plastic bags that zip or press-stud together that I have kept from blankets, grobags and other gifts that come in suitable packaging. If they get accidentally tipped off the shelf, at least the pieces will stay in the correct bag. It cost a total of $62 for the containers which was more than I had hoped but a lot less than some methods I came across. It also means that the children are now regularly choosing to sit down and do a puzzle which had not been happening at all in their jumbled state. Plus, every time I walk past I give a little sigh of satisfaction at that organised shelf! One more thing to cross off my list. Now for project 982…. I have to admit, some of the ones we gave away were just because I was getting tired of organising them!